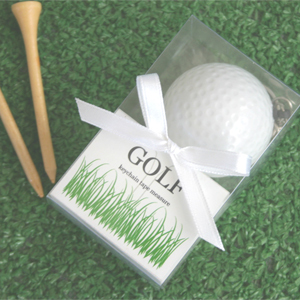 These golf themed favors are sure to be a hit at your wedding or golf outing.Personalized Golf Balls, Personalized Golf Tees, Golf Luggage Tags, and Golf Themed Cookie Favors are great for golf themed weddings for weddings or events on location at a golf course. 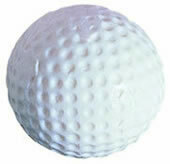 These really cute baby golf balls are perfect for baby shower favors and also baby announcements. You can hand them out at the hospital or give them to your friends and family that come by your house. These are great if you are having men at the baby showers. 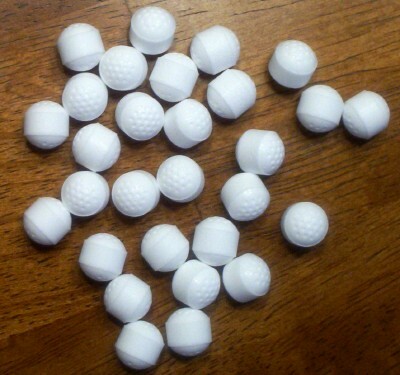 Baby golf balls are something that they would love. Price is per pack of 3 in a sleeve. Cookie Favors - Golfbag These cute cookie favors are made with a lemon sugar dough. They are packaged in shrink wrap. You can personalize by putting them in a cello bag and tying a personalized ribbon or adding a hang tag. Each cookie is ~4.5" 2-3 week lead time. Must order in increments of 12 after the minimum of 24. Price is per cookie. 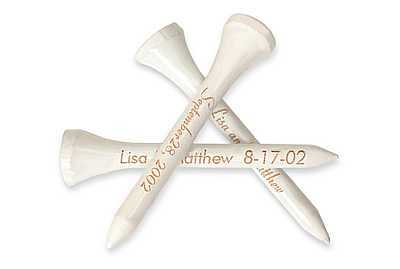 Great for golf wedding favors. Cookie Favors - Golfer These cute cookie favors are made with a lemon sugar dough. They are packaged in shrink wrap. You can personalize by putting them in a cello bag and tying a personalized ribbon or adding a hang tag. Each cookie is ~4.5" 2-3 week lead time. Must order in increments of 12 after the minimum of 24. Price is per cookie. Great for golf themed wedding favors. These golf ball tape measures are great for golf wedding favors. Whether the two of you met over a leisurely game of "love" or golf has just become a favorite activity you enjoy together, you will need a favor that ties in with this sporty theme. This handy tape measure in the shape of a golf ball can make the "par-fect" gift for your guests. One side of the ball is flat and can be personalized for an additional charge. Comes neatly packaged in a clear box and white satin bow. The sporty design on the front gives the look that the golf ball tape measure is resting on a tee. Price is per golf ball tape measure. Minimum order is 24. Size of finished favor: 2" x 3.2", Size of tape measure: 1.75". These unique golf cart pencil sharpeners make great unique wedding favors. 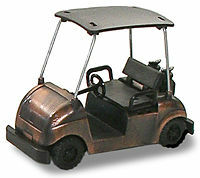 They are boxed, so the golf cart pencil sharpeners will easy to favor wrap. We have personalized gift wrapping paper to make it a truly unique favor. 1 3/4"H x 3"L Price is per golf cart pencil sharpener. Minimum order is 12. Golf themed fortune cookies are great for golf events and golf resort wedding favors. 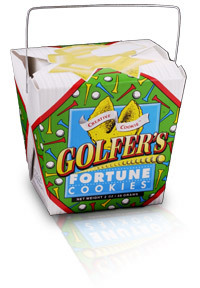 Each golf fortune cookie pail contains 9 golf themed fortune cookies. Price is per pail. These can be personalized with a really cute 1 dimensional "bow". Must order a minimum of 24, and increments of 12 after that, to have them personalized. If you want them personalized add your personalization in the comment field below. Minimum order is 12. Must order in increments of 12. Talk to your wife now. Golf season is coming up soon. Work is for those who don't know how to play golf. "The older I get, the better I used to be." Golf themed sugar cubes are perfect for your golf tea party or to sweeten tea on a nice summery day! 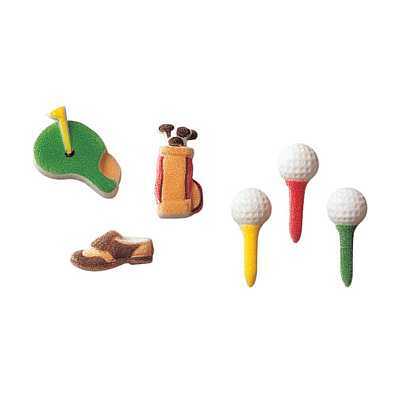 These assorted golf themed sugar cubes are 1.25"L. They can also be used to decorate cakes, cookies, or cupcakes. They are just cute. 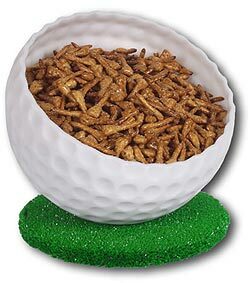 Price is per set of 40 assorted golf themed sugar cubes. Milk Chocolate Golf Balls Are you an athlete or a sports fan? These milk chocolate golf balls will be a big hit with your guests! These chocolates are sold by the pound. Please note that due to the melting point of milk chocolate, it may not be shipped in certain areas, at certain times of the year. Price is per pound. Minimum order is 2 pounds. Must order in increments of 2 pounds. ~72 pcs per pound. Are you having your special event at a golf club house? Or marrying a golf "pro"? These personalized golf balls are perfect! You can package them in our clear favor boxes so that your guests can see them or one of the solid favor boxes so that they will be surprised. They are both sold in our wedding favors packaging section. 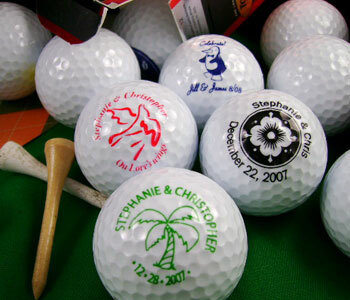 Customize each ball with your names and event date and you've transformed an ordinary golf ball into a treasured keepsake for weddings, birthdays, anniversaries or corporate events. Imprint is one color, and .72" diameter (about the size of a quarter). Minimum order is 40 balls. Price is per personalized golf ball. Please allow up to 2 weeks before shipping. $20 rush fee for 2-3 days processing time before shipping. Please add your personalization in the comment field below. Please note character limits for the personalization. If you have too many characters, it will only delay your order, until we can get it corrected. Click on the view button to see designs. Personalized Golf Tees II Time for tee? Guests will remember your special day every time they plant one of these into the green. Personalize them with one line of text (up to 22 characters) in a choice of two type styles. 100 tee minimum. We will not split orders. Tees are white and text is laser engraved onto the tee. This item ships within 10 business days of the date that the order was placed. Price is per 100 tees Put personalization information in the comment field below. Personalized Soda - 24 bottles/case 12 Oz Bottles. These personalized drinks or personalized soda are the most adorable favors! Spring Water with flat cap, Old Fashion Rootbeer, Diet Rootbear, Vanilla Cream, Black Cherry, Orange, Raspberry Lime Rickey, Grape, Carbonated Fruit Punch, Iced Tea, Sarsaparilla, Ginger Beer, Natural Sparkling Water, Lime Sparkling Water, Cherry Sparkling Water. Sold by the case only. You can not mix the flavors within a case. Click to view labels for beverages Put the design number in the comment field below. If you don't see a design that you like, describe the desired graphic in the comment field below. 24 hour lead time once order is confirmed. This does not include shipping time. You will be emailed your shipping costs. East Cost is usually around $10 - $15 and West Cost is around $18 - $25, per case. We do get discounted shipping on these cases, so it is really hard to give you an exact amount until it ships. Great for golf themed wedding favors.